History books don’t favor riots. Revolts? Sure. Rebellions? Even better. Revolution even implies something flirting with actual permanence. But riots? They’re often just seen as a kind of collective temper tantrum, a futile flash in the pan. That is, unless they serve as the opening salvo of something much greater. If I remember my VH1: Behind the Music correctly, there was a time when the White House called up Ice-T so he’d explain the L.A. riots to them. And Ice-T said it was like when you’re in prison and you get so frustrated that you set fire to your own mattress. The very portrait of futility. I recently revisited that draft, along with a thing on the Occupy Movement. Then, in the past week, we’ve watched Baltimore burn. For me, it’s been the elephant in the room. There’s a fine line between “too timely” and “too soon.” What’s more, I’d hate to think I’m joining the ranks of the many Facebook grandstanders spewing moralistic quotations. Or worse, like one of the opportunists with “hot takes,” as described by an old friend of mine. Like many of us, I have no idea what it’s like to grow up with the kind of adversarial, antagonistic relationship with local police that West Baltimoreans experience from early childhood on. But I want to ask (I hope not too naïvely) how we can translate the past week’s horrific events into something good—some fundamental shift both in our communities’ relationships with the police and in our country’s treatment of its struggling lower classes. What revolution can this riot start? I agree with John Angelos that the problem is systemic, but I don’t know what comes next. I also admire Dan Diamond‘s excellent, studied “Tale of Two Baltimores.” Collette Shade illustrates this distinction well by interviewing the attendees of Saturday’s Maryland Hunt Cup, most of whom were blissfully unaware of the riot brewing outside Camden Yards. But what would it look like to reconcile these two cities? And is it even possible? We’ve all seen plenty of MLK quotations lately. It should go without saying that King’s non-violent methods were undoubtedly effective in their time. The end result of his efforts was a Supreme Court ruling. But what do you do when the people’s demands are so viscerally basic as Please stop murdering us? After all, we’ve got a law for that going back to Moses. And what do you do when the people you’re asking are the very ones sworn to protect your rights and uphold the laws of the land? My point is that I don’t see what the legislative endgame is here. Police cameras? The Eric Garner case proved that solution irrelevant the same week it was proposed. So where does all this destruction lead if not back to the status quo—to business as usual? This can’t have been for nothing. So what’s next? The destruction goes beyond mere bodily injury and property damage. It has a ripple effect. Many Baltimoreans are old enough to remember the MLK riots in the 60s that ravaged several parts of the city irreparably. Those riots were also the impetus for many to flee to the suburbs, causing Baltimore’s population to experience a 40% drop over the next four decades—from one million to just 600,000 by the early 2000s. And they took their tax dollars with them. I could say that I feel the protesters’ pain, and I do, but that presumptuous, unsolicited validation would still only sound patronizing and condescending. I could also say that many of the looters who roundly pillaged Mondawmin Mall and elsewhere after Freddie Gray’s funeral on Monday were opportunistic parasites, dishonoring a mourning family’s stated wishes and maligning an otherwise righteous cause. But then, I’m probably an opportunistic parasite for writing this article, joining a greedy media choir with as many “hot takes” as I can muster. It doesn’t matter either way. At the 10 p.m. curfew last night, Congressman Elijah Cummings was urging citizens to go home with a bullhorn, while swatting away the Fox News gadflies hoping to make political hay out the riots. Noting that the media were the last to leave, he finally told them to go home too: “You’re taking pictures of each other.” This dialogue is too important to let it lapse into some unduly opinionated, narcissistic circle-jerk. When I was a kid, Mayor Schmoke painted all of Baltimore’s bus stop benches blue, with the city’s ambitious new motto: “Baltimore: The City That Reads.” Unfortunately, these benches quickly revealed their true function as hosts to homeless men and women, covering themselves in newspapers—not for reading, but for sheer warmth. 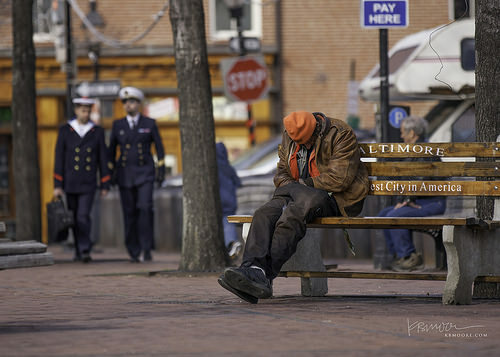 Then a few years later, that literacy campaign lost out to a new, almost audaciously hubristic one—the very Icarus of bench slogans: “Baltimore: The Greatest City in America.” Same homeless person; same newspaper. 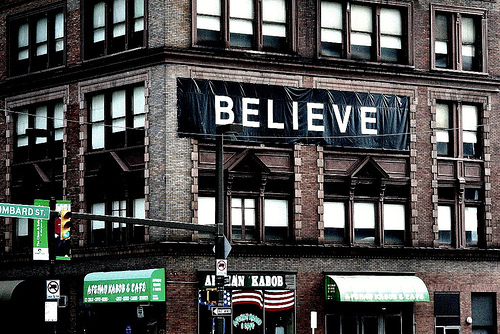 Which brings me to another city motto, this one from 2002: “Believe.” Belief is not the same thing as hope, especially baseless, blind hope. Still, I hope that Baltimore can rise from the rubble, begin to heal itself and become the great city it deserves to be. I hope so many things for Baltimore, the city I love and watched burn. But I want to believe. Paul Cantrell is on Twitter.